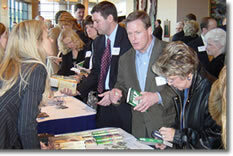 You can become involved with Real Estate Prayer Breakfast as a host committee member, a sponsor or a volunteer. For more information, contact Cindra Vaden at 404-271-9070 or email to admin@realestateprayerbreakfast.org. You can easily become involved with the Annual Real Estate Prayer Breakfast by joining the Host Committee. The Breakfast is partially financed by the Host Committee who have volunteered to purchase a table . The Hosts are then responsible for inviting guests with whom they would like to share the message of Jesus Christ. A table (seating 10) costs $600 and a half table (5) costs $350. Purchase half a table (5 seats) or a whole table (10 seats). Attend the Host Committee Orientation Session. Give permission to list your name and company on the invitation and website. Fill your seats with individuals from the real estate community that do not have a personal relationship with Jesus Christ.